There are some other great features with this app. In the settings for the app there are the basic settings like turning the picture and location features on and off and setting the email address but the additions settings are what make this app even sweeter. One is called “Prevent OFF”. When the device is locked, it won’t power off when holding down the power/lock button. This would allow apps like “Find my iPhone” and Google Latitude to continue tracking the device. 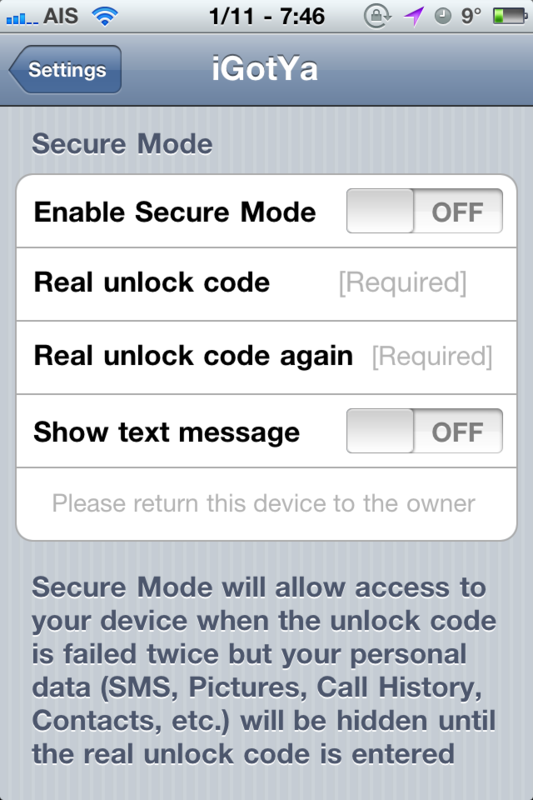 Another feature is called “Secure Mode”. 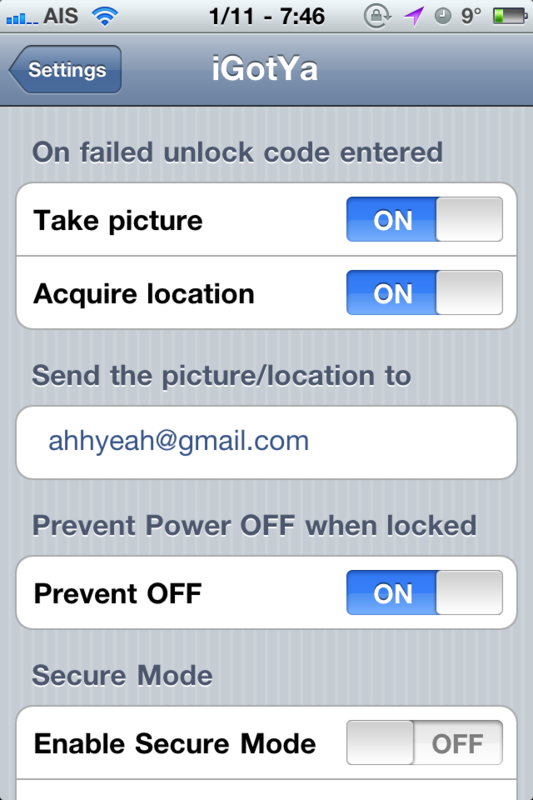 This allows the iPhone to be unlocked but personal information like contacts, email, photos, and texts to be hidden. This is nice if the iPhone is needed to make an emergency call. Overall, a well put together app. It’s priced a bit high at $6.00 but if you need the extra security, it’s probably worth it. I need some help. 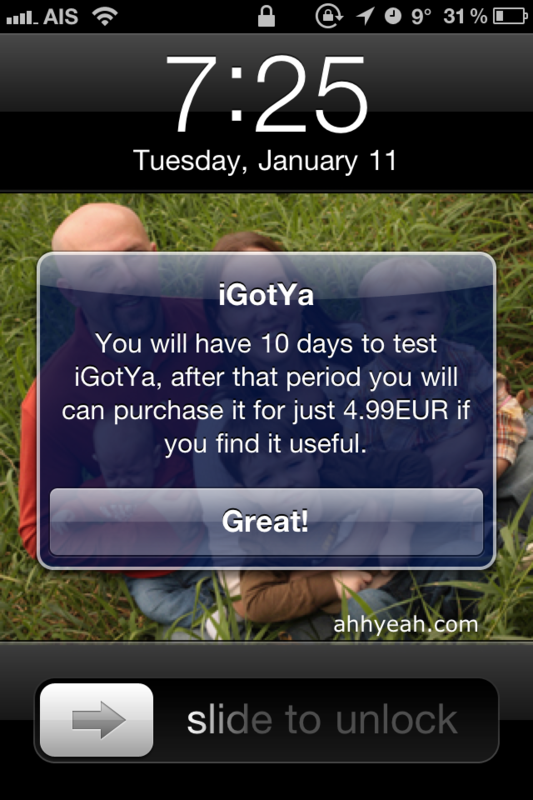 I downloaded Igotya app and tested it. I put a wrong password twice.I am on a trial mode(10 days). It erased perhaps hidden my setiing tab and all my jailbroken apps. How do get it back if the setting tab was hidden? I never sync or connected to any computer. Why all my apps was deleted? 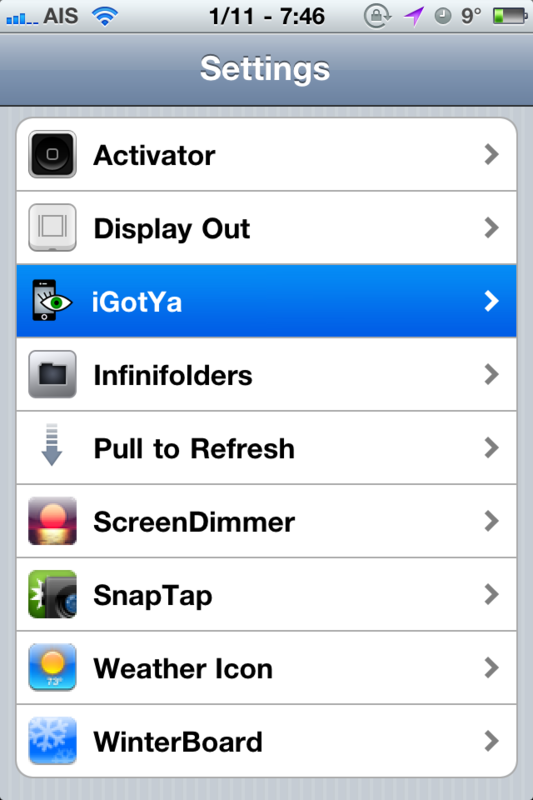 I just purchased the iPhone 5 and I can’t seem to find the “IGotYa” app in the App Store. I still have my iPhone 4s and its jail broke already and I have Cydia. However that doesn’t help me get it for my iPhone 5. If anyone knows how I can retrieve the app I would greatly appreciate it. Thanks a bunch. You can still send the phone into DFU mode by holding the power and home button. I need some help. I do not want my ipodtouch to be jail broken, I got cydia but I can’t find Igotya . Any advice on how ? I would appreciate that very much. Thx!